Packaging Details Height Width Depth Weight 3.9" 2.09" 2.09" 2.42 oz. Details Suppresses estrogen production. Restores testosterone production. Naturally occurring. (These statements have not been evaluated by the Food and Drug Administration. This product is not intended to diagnose, treat, cure, or prevent any disease.) 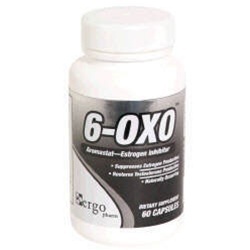 Nutrition Facts Serving Size 3 capsules Servings Per Container 20 Amount Per Serving % Daily Value 6-OXO (3, 6, 17-Androstenetrione) 300 mg *percent Daily Values are based on a 2,000 calorie diet. Ingredients: Other Ingredients: Micro Crystalline Cellulose. *These statements have not been evaluated by the Food and Drug Administration. This product is not intended to diagnose, treat, cure or prevent any disease. Directions As a dietary supplement, take 3 to 6 capsules at night with last meal. Take for cycles of 4 to 6 weeks. Store in a dry, cool place with lid tightly closed.